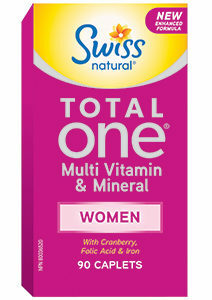 A Canadian household staple for over 80 years, providing almost immediate relief to minor skin wounds and irritations. 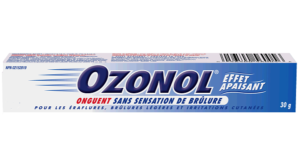 Loved and used by Canadians, Ozonol treats scrapes and minor burns and skin irritations, insect bites, chafing and chapping. Soothes and protects and brings almost immediate relief and will not sting. It all started with Rolf Zimmerman and his wife, who had a passion for nutrition and natural remedies. The couple would import herbals from their homeland for local consumers. Soon the demand for their natural remedies allowed them to focus on developing and distributing for all Canadians. 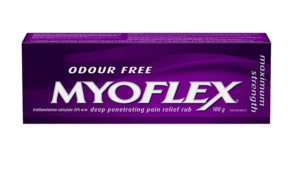 Myoflex was introduced to Canada in 1970 as an effective pain reliever for nagging muscle and join pain, without a telltale odour. As a strong brand with good reputation, Myoflex is trusted as an anytime, anywhere pain reliever that provides effective pain relief without an odour. Exzell Pharmaceuticals is a fast growing Canadian Speciality pharmaceutical company based in Markham, Ontario. Originally focused in helping treat patients with Gastrointestinal disorders or side effects, Exzell now sells various pharmaceuticals, from analgesics to vitamins and minerals. Health Canada approves EsopH as an innovative oral therapy for Gastroesophageal Reflux Disease (GERD). EsopH’s unique mode of action allows it to be an effective and safe alternative to Proton Pump Inhibitors (PPI). Made of naturally sourced ingredients, EsopH can be used in place of, or as a complement to prescription therapies. 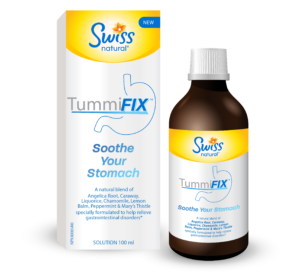 Swiss Natural’s new product – TummiFix is a herbal remedy to relieve gastrointestinal disorders. The special blend of seven herbal ingredients helps reduce multiple digestive symptoms such as stomach pain, abdominal cramps, bloating, gas and nausea.